How many people do you know who absolutely love pasta? After all, there is something about this form of carbohydrates that is absolutely delicious, especially when you take into consideration the kind of condiments and fillings that it comes with in the hands of a master chef. 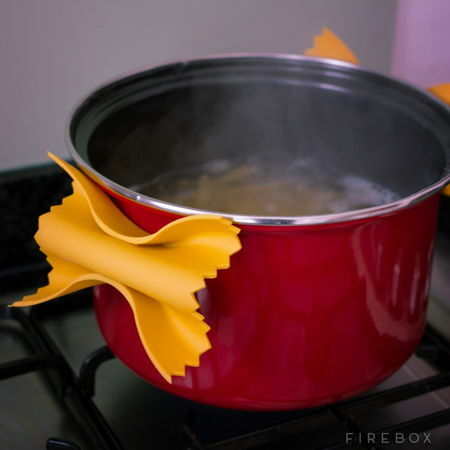 Most folks would bring their favorite pasta to boil in a pot, and holding the ears of the pot might be a health hazard – so why not go the whole nine yards and provide your hand with adequate levels of protection thanks to the £11.99 Farfalloni Pot Grips? This giant pasta accessory is made from heat-resistant silicone and is super easy to clean, coming in just the right firmness for gripping pan handles so that you can now replace those revolting food-covered oven gloves of yours.